Welcome to Day 26 of my month long series “How to Organize Your Kitchen Frugally in 31 Days”. Every day during the month of October I will be sharing an organized space in my kitchen with you. My goal is to inspire you and give you ideas on how you can organize your kitchen. Today we are looking at pot and pan storage. Of all the ideas I have posted for this series, this one is by far my favorite. It’s one of those that is so simple, yet has saved so much aggravation and I have been looking forward to sharing it all month! I have struggled with organizing my pots and pans for years. I have tried almost every inexpensive solution I could find to organize them in a way that worked well. Sure, I’d buy a pull out drawer with dividers if I had hundreds of extra dollars, but I wanted a solution that wouldn’t break the bank! I’ve searched for products that would make it simpler to get my pots and pans without having to unstack them every time. They are heavy, cumbersome, and since they are stored in a lower cupboard, I sometimes have to get down on the floor and dig through the pile of pans. Lets just say this is not my favorite thing to do! Can you say ***LOVE***!?!?! Besides the fact that it appears to be featured in the dream kitchen I have in my head and not my real kitchen, I think this is such a great use of space! However, I realize this is definitely out of my budget right now! So what to do with a great idea on a small budget? DIY a knock-off! 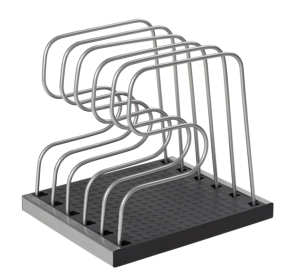 One of the things that I love about this organizer is that the pan dividers are adjustable. 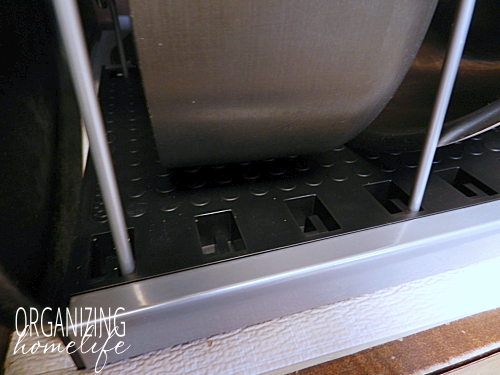 The pots and pans I use most frequently are all different depths, so the need for adjustable dividers was a must. 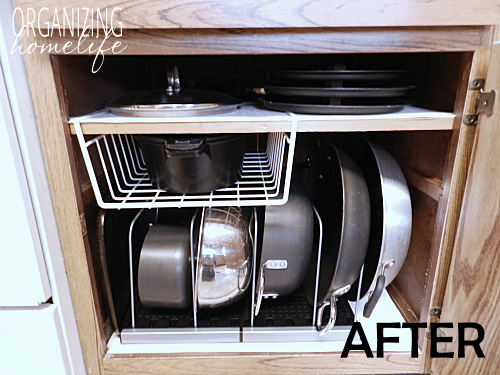 I wanted to keep the pots and pans I use daily right in the front so I could grab them easily without having to unstack! I don’t mind keeping pots I don’t use often in the back of the cupboard, but I want easy access to those I do use regularly. When I was first married I got a whole set of expensive cookware. But over the years, I have added a few and gotten rid of a few. Of course my frying pans have had to be replaced, so I have somewhat of a mix-matched set. I could see that the dividers could easily be removed to make wider spaces for my deep pots. I ordered 2 at just over $13 each. I put them in my cupboard and decided on the placement of my pots and pans so I knew which dividers to remove. They came with hardware, but since I wanted to be able to access the pots I infrequently use (which I was planning to store in the back of the cupboard), I didn’t want to screw them to the bottom of the cupboard. I simply set them side by side and put my pots and pans in. The weight of the pans keeps them in place. I was ecstatic with the results! Now I can easily grab the pot I need without unstacking! And it only cost about $26! I wanted to live with it for a while before I told you about it. I’ve been storing my pots like this for over six months and it’s worked wonderfully! I’ll tell you that they do shift slightly with constant use. It doesn’t bother me at all. I’ve thought of screwing the two bases together, but then it would be harder to get to the pots in the back. When I need a pot from the back of the cupboard, I remove one of the racks and the pans on it, and pull the pot out (which is why I didn’t screw it into the cupboard). Honestly, I only pull those pots out when I have a lot of company. Pretty much on Thanksgiving only. The six pots and pans in the front are the ones I use regularly. The only thing this storage method didn’t do for me was allow space for my vegetable steamer (it’s from Pampered Chef in case you’re wondering). To solve that problem, I put an under shelf storage basket under the lids shelf just for my steamer. It’s the perfect size to fit over my smaller saucepans and allows me to have ALL of the pots and pans I use front and central. If you don’t have a shelf for your lids, you could store them on the inside of your cabinet door using a small curtain rod like this pin or with 3M Command Hooks like this pin. I keep mine on my shelf because I usually only use one lid most of the time and it’s easy to grab on the shelf. 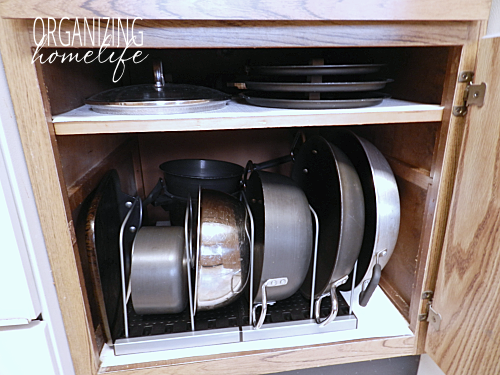 I hope you’re inspired to organize your pots and pans frugally! Tomorrow we’ll be taking a look at why I HATE deep shelves and what I did to fix the problem in my pantry. I don’t want this series on organizing to end. I’m also trying to get things organized on a budget and you have some wonderful ideas! Great idea. I saw the same product that inspired you to come up with this. But, I’m not about to spend a hundred or more dollars to organize my lids. Besides I like how your frugal knock-off isn’t permanent. Absolutely brilliant, Ginny. Thanks for sharing. It’s always fun to see ideas for organizing our spaces. I have a truly awkward space to deal with in the kitchen. The under-the-sink cupboard has doors under the sink part, but the cupboard extends to the wall about two feet to the left of the cupboard door. Is there a way to use that for more than I-don’t-need-that-more-than-a-couple-of-times-a-year items? I have to practically climb into the cupboard to reach the back. If the space under your sink has a cabinet front but no door, maybe you can cut an opening and add a door. If you are worried about ruining the symmetry of the cabinet front maybe carefully cut a rectangular opening and reuse the piece to make a hidden door with a piano hinge mounted on the inside and a magnetic push latch also mounted on the inside of cabinet. ( You might have to attach a small piece of wood inside to mount the latch.) If that extra space does not have a front, you could get an oversized cafeteria style tray that you could slide into space for easier access. Just load stuff on it and slide tray out when needed. Good luck. I’ve been reading your kitchen organization series this week – all great ideas! 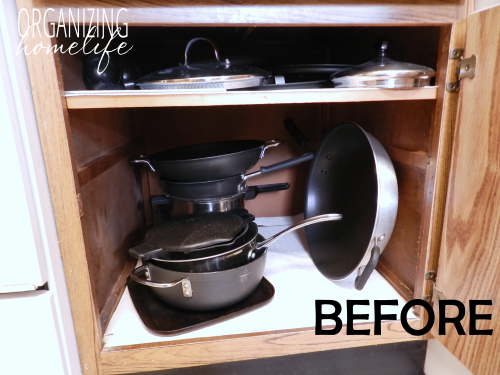 This post inspired me to find a good solution to my stack of skillets in my cookware cabinet. I found a similar product to the one you recommend that should help keep them organized nicely. Thanks for sharing all your tips! If you click on “from Amazon” right under the picture with the red pots, it will take you to the $175 Rev-a-shelf that was the inspiration for this project. Two pieces of the 10″x10″ organizer were used in this project for a total cost of about $25. If you put the lid on the pot upside down, with the handle inside the pot, then you could store the lid together with its pot. I love this solution because it is removable. I am planning a big kitchen remodel in just a couple years. I don’t want to spend a lot of money on stuff that won’t fit the new kitchen. Since this isn’t bolted down I can transition it to my new kitchen later. 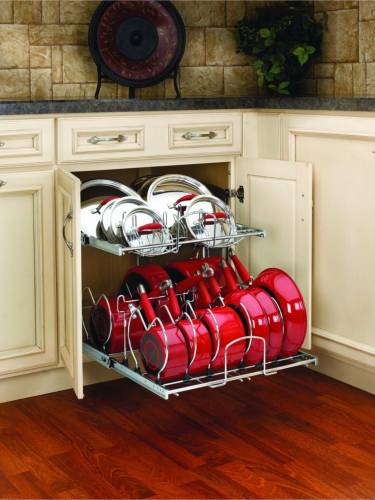 If I get the overhead pot rack I want, I’m sure I can adjust this to work for baking trays. I still don’t understand where you got the two items?? Just above the first photo of the organizer rack used is in blue lettering the words “adjustable bakeware organizers here on Amazon”, click those words and it will take you to them on Amazon. Thanks for sharing your ideas – I’m organizing my first “real” kitchen and feeling thankful for this blog!